If you're an animal lover, you might love this movie. 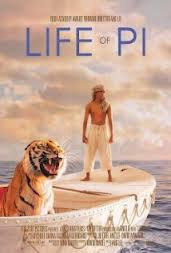 The movie chronicles the remarkable journey of an Indian teenager who is trapped on a lifeboat with a Bengal Tiger. The plot of the movie doesn't follow the typical Freytag's pyramid. 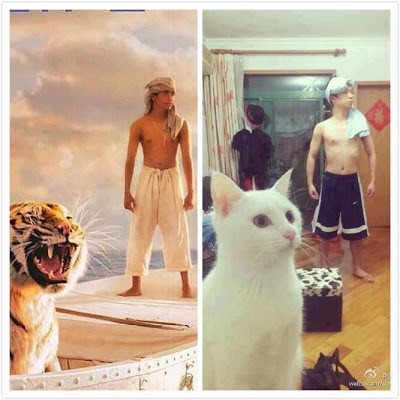 In fact I think the actual climax of the movie was when the ship sunk. And it doesn't end the typical hollywood way--no fireworks, no exuberant celebration. For me the ending could only inspire a sigh of relieve, and I think that's good. I've had enough hollywood endings I think it's time for me to try other flavors. And it gives you more questions than answers. As always I just couldn't stop questioning some the scenes; the bioluminescence of sea creatures, the duration a tiger can go without feeding, and the ability of the boat to stay afloat even after being flooded by seawater following a terrible storm, and there's this carnivorous island; it's more Avatar than Frozen Planet. In spite of all the positive comments on imdb.com, there is one big flaw in the movie; there are way too many CGI scenes in the movie. I long for the days when movies like The Jungle Book (1994) and Free Willy (1993) were produced using real animals, or at least using animatronic surrogates. 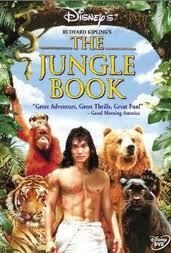 So I was anticipating for more participation from real animals in this movie. I did enjoy the movie though, and I would definitely recommend the movie to all. There are more underlying meaning in the movie than meets the eye, for example the name of the ship Tsimtsum is actually the Jewish mystical term for "God's withdrawal". The rest, I leave them to you to decipher. The life of Pi showcases the ugly side of nature, a side which many of us just wouldn't want to accept. But when you're trapped on a boat with an animal that sees you as its next meal, facing the truth is what you need.